Hjälsta church dates from the 1400’s when it was constructed to replace the 13th century church which was located 600 meters south. The old church ruins were investigated in 1994, finding traces of the old foundations and cemetery with the graveyard wall. Reportedly, the old porch and vestry stood until the 1700’s. The old church had been abandoned because of a rise in Lake Mälaren’s level which caused the same in the local water table. The ground began to sink. So, a new church was planned on higher ground. 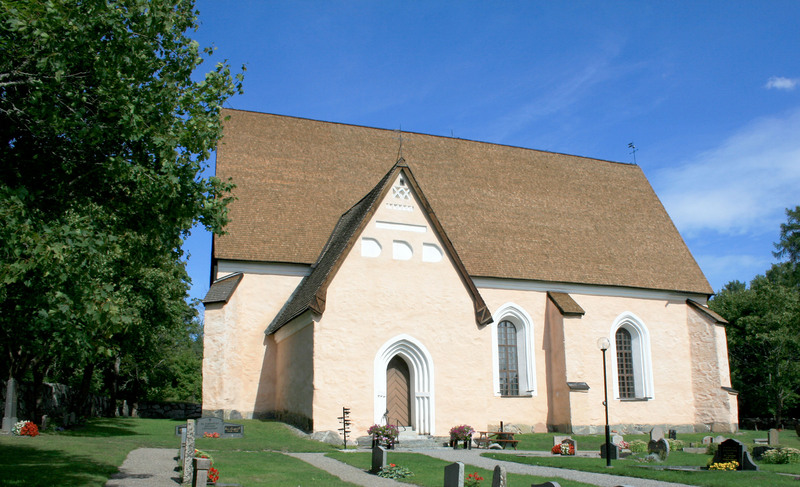 Hjälsta is a stone church consisting of a nave with an attached sacristy to the north and porch to the south, both constructed only after the nave had been completed though the vestry had been planned from the beginning. The arches rest directly on the walls indicating they were constructed at the same time. Recordings from a medieval ledger give good details of the current church. Work on the nave and chancel were started before 1470 and completed about 20 years later. The vestry and porch were added thereafter and at about 1490 the work was completed. The exact date of the church’s consecration is unknown, but likely occurred during the 1480’s with completion of the nave and chancel. Since medieval times, the church has remained relatively unchanged except window alterations in the 1700 and 1800’s. In 1895, renovations were undertaken to give the church a more current design. The closed pews were discarded in favor of open benches in Gothic Revival style. The wooden floor of the nave, resting half a meter above a brick surface beneath, was removed. Between 1951-1955, restoration work removed the some of the changes made in 1895. 1951 saw the introduction of electric heating. In 1955, the enclosed pews were restored.